My husband does little cooking, but the man makes an awesome breakfast! On Sunday mornings that we are both actually home, my husband likes to make a big Sunday breakfast. For the first time in like two months, we got that chance this weekend. It was delicious! 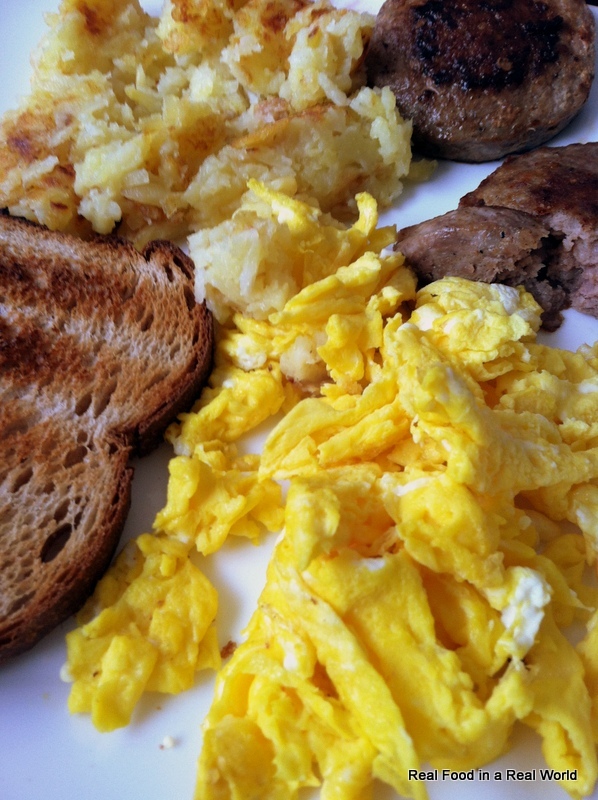 We had eggs (the free range eggs from Natural Local Food Express), hash browns (Alexia brand, also from Natural Local Food Express), Sausage (Grahams Organics, from Door to Door Organics) and whole wheat toast (Avalon 313, from Door to Door Organics). A nice, simple breakfast that tastes gourmet because of using high quality ingredients. This has been one of my biggest lessons in eating local; when you use high quality ingredients, your food will taste amazing, even with simple preparations.